WEST QUEST (CAN) (Brown 1991-Stud 1997). 3 wins-1 at 2-in GB and USA. Sire of 543 rnrs, 319 wnrs, 11 SW, inc. Dream Pedlar (MVRC JRA Cup, Gr.3), Dream Quest, Esterel, Barysh Quest, I'm a Hussy, Zest Amour, Brakim Lass, Lekitama, Braequest, Jay Kay Bee, Found East, SP Marette, Cradle Mountain, Varian, Western Hero, Western Wager, Mystery Quest, Forbidden Quest, Jug Full, Reunification, Aprilia, Aria Quest, Cygnet Jet, Miewa's Quest, Xiao Li, etc. Bidirectional (g. by West Quest). 8 wins. See below. NORSQUI (Matsqui). 8 wins from 2100m to 3200m, A$760,788, SAJC Adelaide Cup, Gr.2, Mornington Cup, L, VRC Lavazza Long Black H., MRC Cove Hotel H., TRC Derwent Park Developments P., Stonemason Wines H., Peter Binny Surveys H., TTC Southern Cross P., 2d ATC Sydney Cup, Gr.1, TRC Betfair Summer Cup-twice, TTC Fashions for Fillies P., TRC HMAS Hobart H., 3d SAJC Adelaide Cup, Gr.2, VRC Andrew Ramsden S., L, MRC Sandown Cup, 4th TTC Launceston Cup, Gr.3. Femme du Nord. See above. Ocean Flyer. 4 wins from 1550m to 2100m, TTC Ken Evans H., Gatenby H., TRC Raine & Horne H., Wood P., 2d TTC RR White H., 3d TTC Australian Liquor Marketers H., Apprentices Cup. Esprit du Nord. 3 wins. See above. Kimberley Quest. 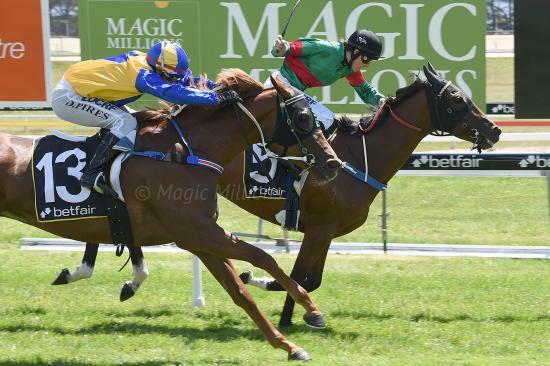 6 wins from 1200m to 2200m, TRC Ingham Jockey Club Cup, TTC TAFE Tasmania Natural Resources H., Governor's P.H., Launceston Parish H., 2d Devonport Cup, TTC Pindari Cellars H., 4th Tasmanian S., L.
Cool Lad. 4 wins from 1200m to 2100m, TRC Motors Saab H., Cascade Premium H., 2d TTC Shaw Contracting H., 3d TTC Roy Coghlan Memorial H.
Inclusion. Winner at 1400m in Aust. Skipping Ridge. 2 wins at 1000m, 1100m in Aust. Devember. 2 wins-1 at 2-at 1100m, 1600m, TTC WI Playsted H., Apostles Parish P., 2d TRC Grahams Funerals Mornington Inn H., Safilo H., TTC NGT Tasmania H., 3d TRC Salamanca Market H., Kelvin Ransley Memorial H., PFD Food Services H., TTC Sunday Examiner Magazine H., Tasman Club H.
Mighty Ocean (Sailor's Reward). Winner at 1400m, 3d Deloraine TC Grand National S/chase, L.
Tasman Light. 19 wins from 1200m to 3200m in Aust. Regio. 4 wins to 1400m, TTC Membership Benefits H.
Glendevie. Winner at 1400m, 2d TTC Foot & Playsted H.
Need a Margarita. Winner at 1400m in 2017-18 in Aust. Storm Gust. 3 wins from 1400m to 1900m, 2d TTC Bird Distillery Company P., Devonport RC Tasracing Off the Track P., Sharee Marshall P.
New Virginia. 9 wins to 1550m, 3d VATC Lightwood H.
Maria Island. Winner. See above. Ocean Splendour. Placed in Aust. Race Record: 32 Starts 8-6-6 A$127,525. 8 wins from 1600m to 2150m, A$127,525, to 2018-19, TTC Sydeston Cup, SB Freeland H., Longford Cup NewYear's Day H., Boris Thornton H., Sue Rees Modelling P., TRC Brallos H., MMIB Insurance P., 2d TRC Jet Couriers H., Tasracing H., Tassal H., TTC Steve's Liquor H., Helloworld H., 3d TRC Great Northern Brighton Cup, TTC Sydeston Cup, St Leger H., Dolly's Dream H.